Earn money just for passing along the savings! The American Foreclosures.com Affiliate Program makes it easy for you to earn a commission every time someone you refer registers for a membership. It’s a great way to help friends, family and clients gain access to the most comprehensive, up-to-date database on the web and GET PAID for your efforts! It’s free to join our Affiliate Program and easy to track your commissions. Do you publish a website? Simply display our eye-catching banners on your content pages prompting visitors to click through. You can still become an affiliate even if you don't have your own website! Using unique promotional codes, you can spread the word to personal and business contacts. Create and manage your campaigns via your own Affiliate panel. 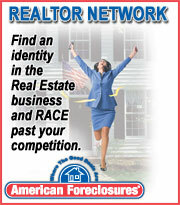 As your visitors register for AmericanForeclosures.com memberships, watch your commissions grow! Earn 25% for all new memberships initiated by your efforts. Continue earning 25% for each month your clients remain members on American Foreclosures.com. Select from a variety of banners. Participate in the Affiliate Program even if you don't have a website. Track affiliate sales via your own secure interface.